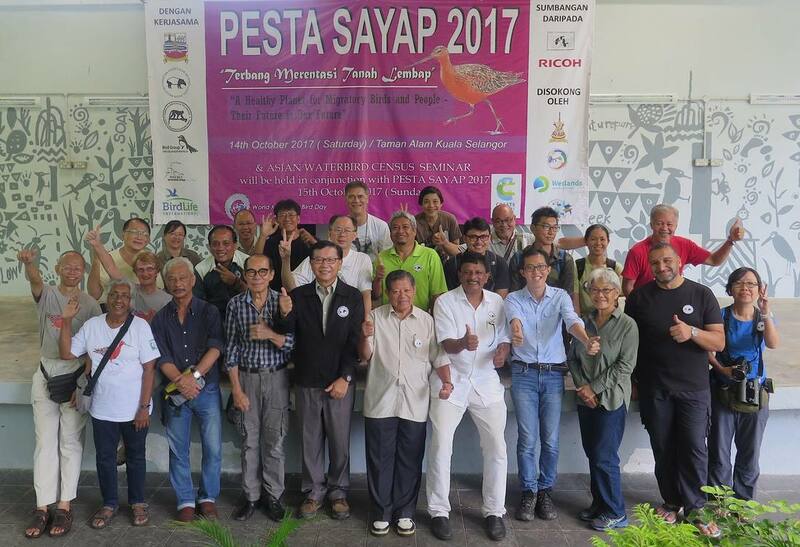 This year’s Pesta Sayap was organised by the Malaysian Nature Society (MNS), together with the District Council of Kuala Selangor, the MNS Selangor Branch Bird Group and MNS-Bird Conservation Council (waterbird study group), and with the support of the Selangor State Government. The Festival was launched by MNS President, Henry Goh together with the representative from the district council. Immediately after the launch a special video entitled “Chasing Corals” was shown. About 500 participants including 350 school children, community groups (Penang Inshore Fishermen Welfare Association; Sahabat Raja Rimba; Sahabat Beruang Madu; Kelab Alami KAWA; Sungai Buloh Sasaran), NGOs, Wildlife Department of Selangor and other local governments, walk in public together with MNS members celebrated the 13th Pesta Sayap. A range of activities highlighting the conservation of wetlands and its biodiversity for the school children, local community and public were held. Activities include mangrove plant fundraising sale and planting, nature videos, exhibits, guided walks, green music, nursery planting and community sharing sessions. Started in 2004, the annual Pesta Sayap was developed to create awareness about the coastal wetlands and welcome the migratory birds that flew along the North Central Selangor Coast from the North. This celebration included the world famous synchronous fireflies and the beautiful mangrove forests and wildlife of Kuala Selangor Nature Park.